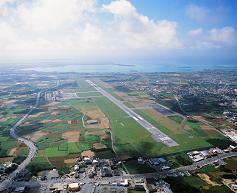 Miyako Airport was constructed as a Navy Airport by the imperial Japanese Army in June 1943. Regular scheduled operations began in June 1956. The runway and apron were upgraded to accommodate YS-11 flights in 1968. The airport was further developed and expanded in accordance with the Aviation law in 1972 to resume service with a 1,500m-long runway in March 1975. The runway and the other aviation security facilities were repaired in response to an increase in passenger numbers in order to accommodate larger planes. The airport began operating as a tentative jet airport in December 1978. A project launched in 1979 to extend the runway to 2,000m was completed in July 1983. A new project, which began in 1992, to relocate the terminal to the east side of the airport to from the west and upgrade the airport to accommodate larger aircraft in accordance with passenger growth was completed July 1997. A new taxiway was established to reduce congestion in June 2001. Two taxiways are currently in service. 1956/ 6 Operation of civil aviation commenced. 1973/ 2/27 Specified Third class airport by the Cabinet Ordinance. 2008/ 6/18 Appointed as Local airport by the Cabinet Ordinance.